Whipped cream is cream that has been beaten by a mixer, whisk, or fork until it is light and fluffy. Cream is usually whipped with a whisk, an electric or hand mixer, or a fork. Whipped cream is often flavored with sugar, vanilla, coffee, chocolate, orange, and so on. 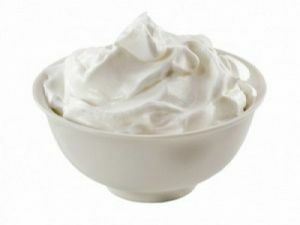 Many 19th-century recipes recommend adding gum tragacanth to stabilize whipped cream; a few include whipped egg whites. Whipped cream may also be made in a whipping siphon, typically using nitrous oxide rather than carbon dioxide as the gas in the cartridges. Ready-to-use in pressurized containers are also sold at retail. Whipped cream or Crème Chantilly is a popular topping for desserts such as pie, ice cream, cupcakes, cake, milkshakes and puddings.